Niagara Falls, NY - City leaders will join Todd Vaarwerk, Director of Public Policy for Independent Living of Niagara County (ILNC), center, for a ceremonial groundbreaking on renovations and improvements to the Hyde Park Centennial Shelter in line with the standards set forth by the Americans with Disabilities Act. Niagara Falls, N.Y. - On Thursday, June 22 at 1 PM, city leaders will join Todd Vaarwerk, Director of Public Policy for Independent Living of Niagara County (ILNC) for a ceremonial groundbreaking on renovations and improvements to the Hyde Park Centennial Shelter in line with the standards set forth by the Americans with Disabilities Act. 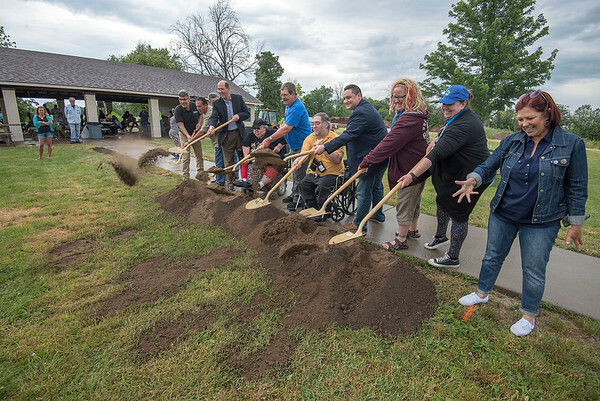 The groundbreaking is set to coincide with ILNC’s Disability Pride Niagara Olmstead Family Picnic, held annually at the site. The announcement comes as a result of strong partnership with ILNC and the creation of Mayor Paul Dyster’s ADA Taskforce, formed to ensure accessibility for all residents and visitors to the City of Niagara Falls.